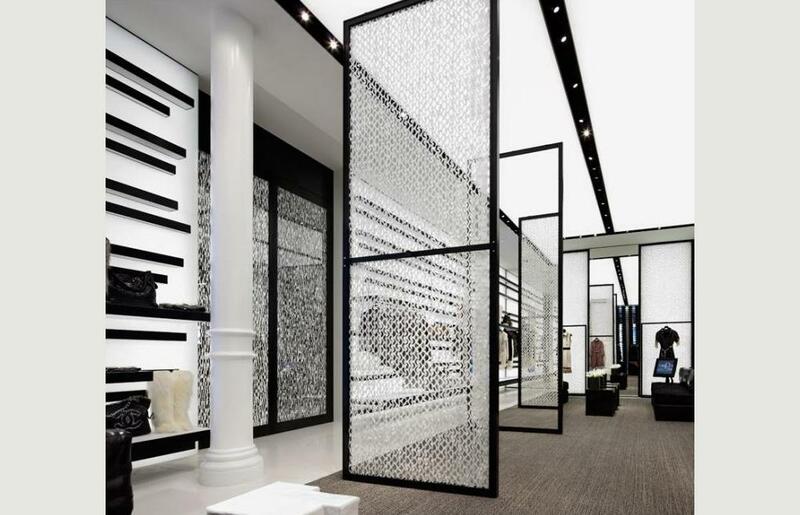 More »The new 4,170 square foot Chanel boutique, located in the heart of Soho, was inspired by the artistic feel of the neighborhood, and was designed to reflect its legendary spirit. Its interior design also draws inspiration from signature icons of the house and from materials reminiscent of the brand. Works by artists Peter Belyi, Robert Greene, Gregor Hildebrandt, Alan Rath and Richard Woods were specially commissioned to highlight the space, and meld with the streamlined black and white graphicism of the boutique’s interior to provide an appropriate edge for the customer that lives, works and shops in Soho. 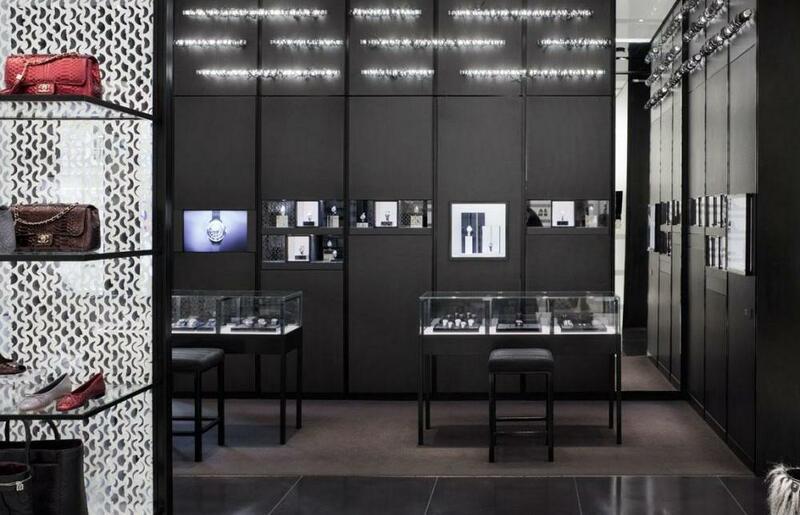 The boutique flows through open space, with each product area leading into the next. 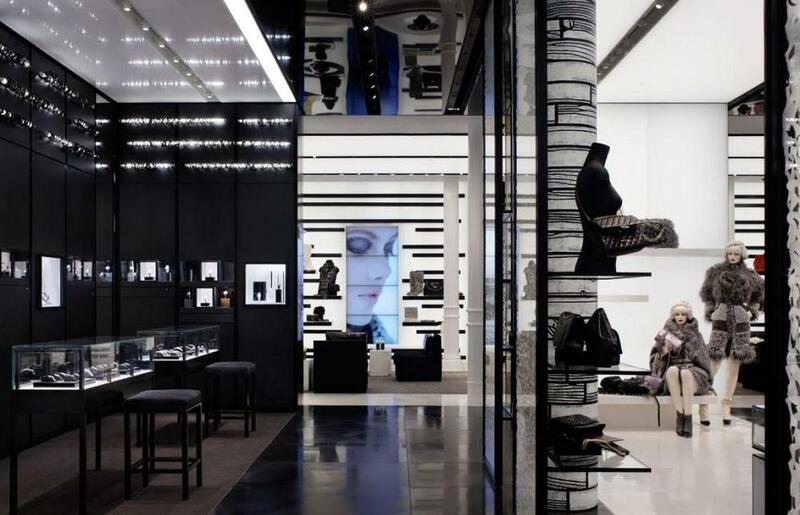 Upon entering the store from Spring Street, clients are immediately drawn to an acrylic bottle of Chanel No.5 that stands over ten feet high, whose surface displays constantly changing Chanel-themed video. 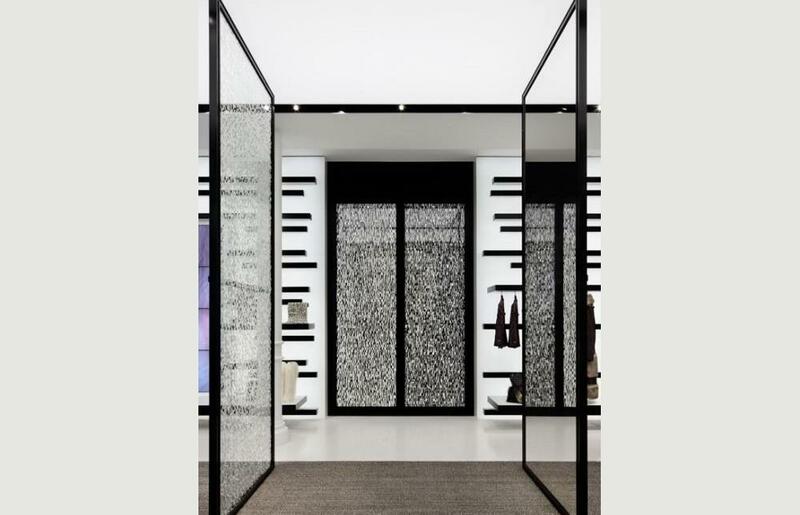 A specially commissioned black and white woodblock pattern by artist Richard Woods encases the columns in the Accessories area. Further into the space is a new handbag “bar” displaying exclusive handbags. Opposite this area is a custom created Fragrance and Beauty area. “Flying Eyeballs”, a commissioned piece by Alan Rath, complements the new sunglass wall beyond the designated F&B area. A new Watch corner features a light and rubber tube installation by Peter Belyi, created especially for the space. Custom tweed fabric and woven carpets, reminiscent of iconic Chanel tweed, serve as a backdrop for viewing the latest collection of watches. On the opposite wall, custom created triangular stools, complementing the newest collection of shoes, feature a black and white woven textured fabric with a chrome base. The Ready-to-Wear area at the store’s far end features a specially commissioned work by Gregor Hildebrandt titled “Record Wall,” composed of vintage molded records in a metal structure. Signature Chanel black-on-black patent leather woven fabric upholsters custom created club chairs. The warm, residential environment in the space is further enhanced by custom tweed carpets that complement the latest Ready-to-Wear collections. Two commissioned works by Robert Greene, in black and white oil paint on vellum, line the fitting room doors.